Yesterday was a sad day here at Bumblebee Garden. 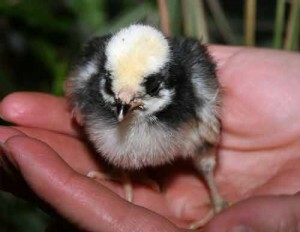 Maxine, our very new Polish chick, passed away. First thing in the morning she was fine, chirping and hopping around with Minnie Ruth and Olivia. An hour later she was down and unable to walk. An hour after that she was on her side and unable to move. She expired shortly after. Marvel that the other baby chicks are clearly disconcerted by the problem with their friend chick. Wrap the baby chick in a clean towel and place her in a box in a quiet place. Examine her obsessively for cuts, bumps, bruises or other signs of trauma. Spend 30 minutes sitting and observing the other chicks as they turn their attention back to pecking and chirping without their friend. Return to the box to make sure the chick is really dead. Wander around the house and feel a sense of being out of control. Try to wrestle control issues by obsessively organizing the office, polishing the furniture and putting away books and papers. Email, Plurk and Twitter friends about the chick’s passing. Try to eat lunch—definitely not chicken. Return to the box to make sure the chick is really dead. Feel the futility of checking to make sure the chick is really dead. Obsessively clean the chicks’ playpen, rig new heat lamp and coo soothingly to the remaining chicks. Meet son as he returns from school to share the sad news. Stand quietly, side-by-side with son, to make sure the chick is really dead. Watch as the macho 17-year-old male insists on giving the chick a proper burial in the woods. Smile in appreciation to have raised a son who cares about such things as baby chicks. Hope he made sure the chick was really dead. Au revoir, Maxine. Bonne nuit. Robin – So sad to hear of your loss. Sometimes the little ones are the hardest, aren’t they? I hope the rest of them aren’t too traumatized. How is it having the chicks besides today’s loss? Sounds exactly like what I went through last spring over a baby bunny. Robin, in her short life, it sounds like Maxine was well-loved and cared for, and well-mourned in her passing. Im sorry you lost a chick)-: That is always hard. I have been through that so many times. I don’t know what happens to them but they seem to die fast. Just like you said one min doing fine the next not. Did you hatch them? Or buy at feed store? Hope the others do fine. Oh, I’m sorry about Maxine. But the poem left me with a smile on my face. Good for your tender-hearted son. And I hope he made sure. Many time the nests of the Carolina wrens that build so close to us are ravaged by squirrels or some other varmint right before they fledge. I get depressed and I must admit in disbelief I have looked more than once in the nest not wanting to believe they are gone. Oh Robin, I had such high hopes for that little chick! It was so cute! But you raised one fine son. I absolutely adore your “what to do.” That was priceless! Awww, my heart just breaks for you. It hurts to loose anything but somehow it always seems worse when they are little. I’m so sorry to hear about Maxine. I was looking forward to watching her grow, like I know you were. My best wishes to the other little ones. I am so sorry about your beautiful Maxine. I also lost a little one Wednesday night – a three week old kitten. It is hard to lose little ones. I don’t even have chickens and I want to save your post in case I ever have a dead ..well, anything! Sending you and the rest of the chicks my condolences. Wow, I can totally relate. So sorry. I had an awful time over a baby bird recently. She’s lucky she had such a loved, happy little life with you. She looks so pretty and sweet and new in the pic. It’s tough. Hugs. Robin – is the one in the picture the same one that died? These things are just adorable. Sorry about the death. Are you planning to get another one or just stick with the 2? ps my bf is really mad at you for continuing to talk about chickens making me continue to want some. Thanks for all your kind words and condolences. I miss Maxine. It seems a little silly, I suppose, to mourn or miss a chick, but I had high hopes for that gal. She was gonna be my STAR with her feathery topknot and all. More chicken stories to come. We lost a baby chick this spring. It is truly amazing to me how the other chicks are so distressed over the death of on of their companions. Your little one was so cute. It is hard to lose a little one. You’ve got a lovely blog here. Oh Maxine, we’ll miss you so. Be happy in chick heaven where there are always fresh worms popping out of the ground in front of you. Robin, this is so touching. I am loving your chickens and came to this post and had to stop. Ah, Jennifer. I have to laugh just a little bit because I can just imagine how you feel. Your daughter Olivia sounds very wise. Keep reading the blog and you’ll see that the rest of the chicks–and my big chickens–are doing just fine. My three older girls are providing me with 3-4 eggs/day. I have eggs coming out of my ears! Hang in there. Chicks do die, I have learned. It’s no reflection on our mothering abilities!